The Skechers Flex Appeal Trainers have a stylish look that willwork with any casual outfit. It features a flex sole, shaped andpadded ankle collar and has lace up fastening in order to create acomfortable and secure fit. 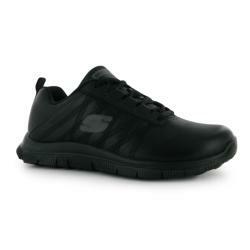 These trainers come with rubber insertsto key areas of the sole so that it provides support for each partof the foot and is complete with the Skechers logo for easy brandrecognition.